Red Hot Chili Peppers in Montreal or Quebec City? Inform me about the next events for Red Hot Chili Peppers. Enroll yourself to our priority waiting list for Red Hot Chili Peppers to be alerted when new tickets are available. Filling this form doesn't engage you to any purchase. The Red Hot Chili Peppers are coming back to the Bell Centre in Montreal on June 20th ! It will be a quick return for RHCP, who performed last summer at the Festival d'été de Québec and the Osheaga Arts & Music Festival. 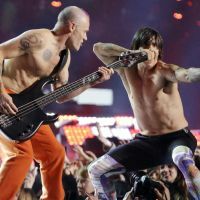 With over 80 million records sold in their 30-year career, 7 Grammys and a Rock'n'roll Hall of Fame induction in 2012, Red Hot Chili Peppers are one of the most popular bands in rock'n'roll history. Don't miss their return to Montreal this summer !